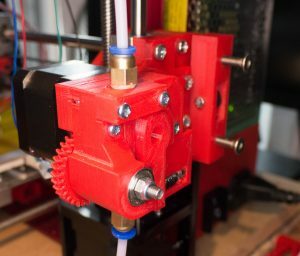 The best solution for my extruder issues is a reduction gear. There are a number of options. I decided on the 3D titan clone. I had most of the bits but had to buy the hobbed gear and the 623z bearing. I did make a little change to the model to have a bowden tube on the inlet as I run a tube from the filament spool holder. 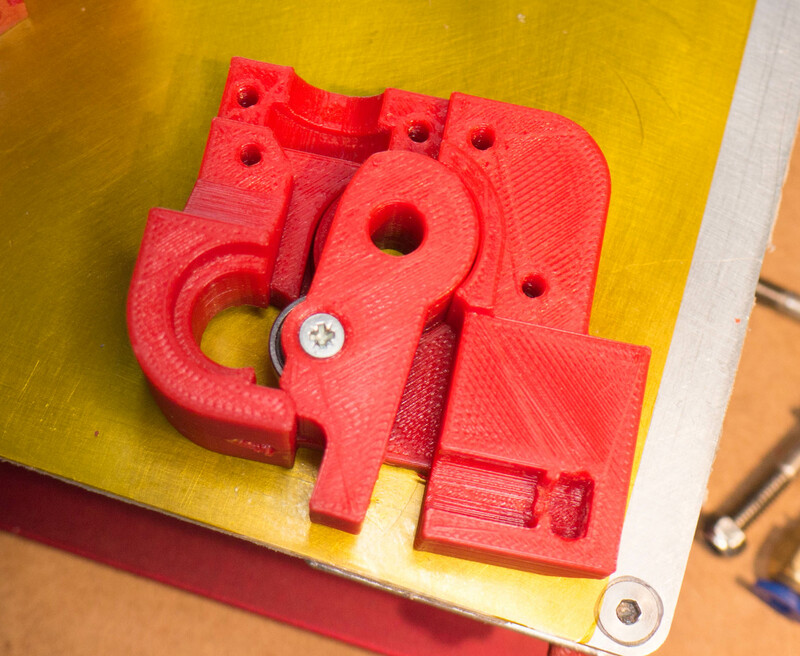 I had a few problems due to the parts I’d bought… not due to the design of the extruder! But as you have probably guessed, I like fixing problems and making stuff better! First off it slipped on the filament like mad. It would feed, slip, feed, slip. 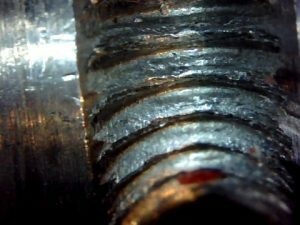 Part of this was the M5 bolt was actually 4.8mm diameter while the hole in the hobbed gear was actually quite accurately 5.0mm. A wrap of blue tape fixed this. But it was still slipping every so often. I had to crank the spring tension up to the point where the PLA was going white in the stress areas! Not good! The idler bearing holder was moving around a lot which was odd and probably not helping the slipping. A quick look showed the bearing was utter crap. There are some proper crap bearings out there as Doubleboost found out. I also had a close look at the hobbed gear and it was not very sharp. 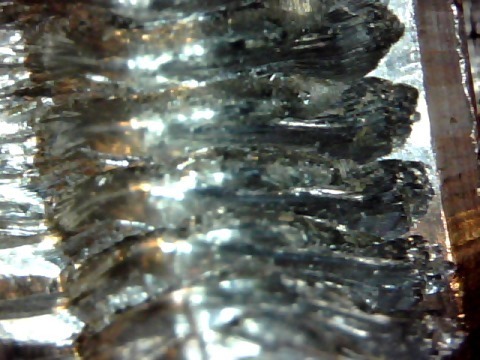 A closeup using my cheesy USB microscope. The tops of the teeth are flat. DOH! So out came the M4 tap and a quick run in the pillar drill ended up with nice sharp teeth! 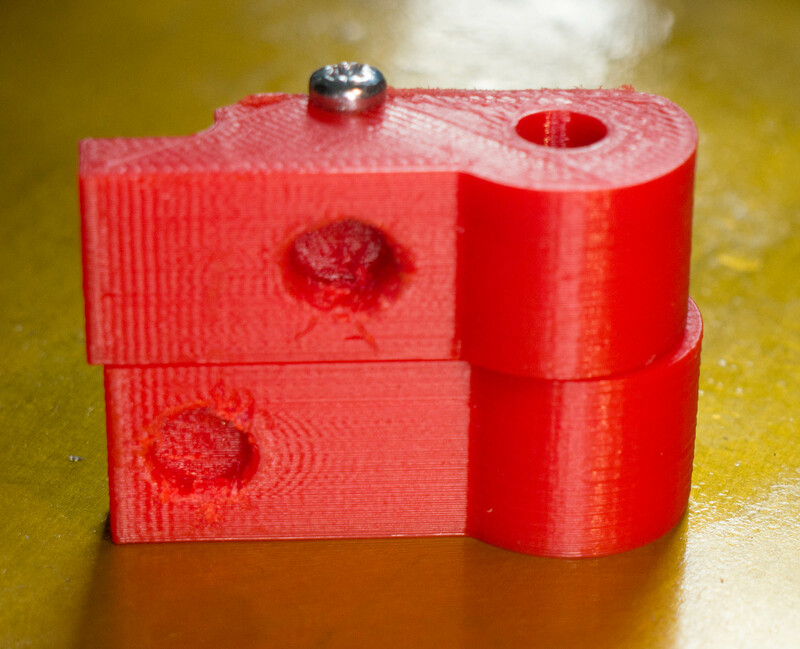 Looking at other extruders the spring usually works on a 2:1 lever action on the idler bearing. The NSTT design has a 1:1 ratio. So I made a couple of changes. First off changed to a 633Z bearing which is wider and larger diameter. Secondly I moved the spring to give a better ratio on the idler. Larger idler bearing on the right. Moved the spring (lower part) to give more of a 2:1 ratio on the idler. 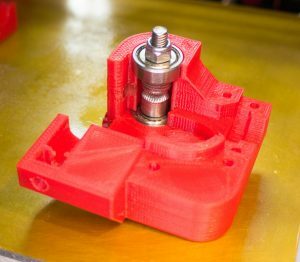 Another change I made was to have the idler assembly hinge on the extruder body rather than on a bearing on the end of the stepper shaft. I didn’t think that was helping the stability as the end of the stepper shaft is D shaped and had a lot of play in the bearing. Hobbed gear and bearings in place. I used some 0.5mm thick shim washers to get the gear perfectly centred. Extruder in place! Now I can put the stepper current back to standard and the motor runs nice and cool again. And with the changes to the gear and the spring the grip on the filament is superb! Status: Almost happy but running short on filament!